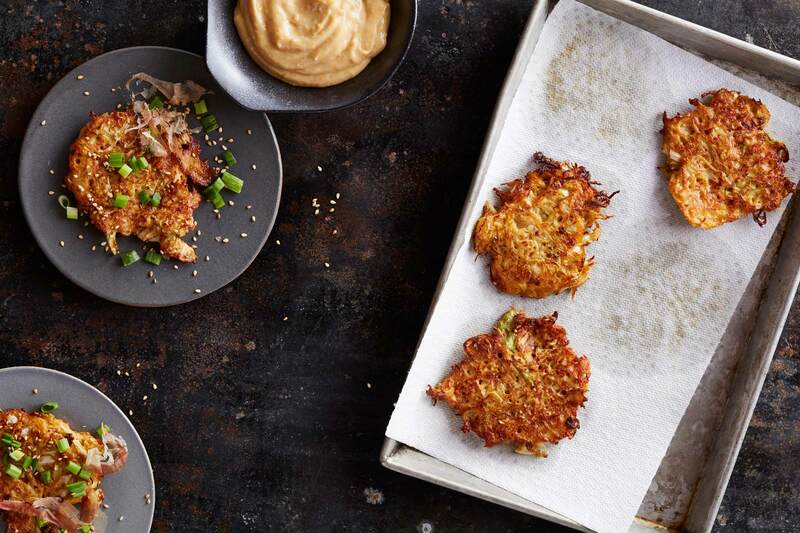 with Asian flavors, panfried like a potato pancake, and served with outrageously seductive miso aioli, the tangled strands of spaghetti squash make for seriously delicious fritters. Bonito flakes, available at Asian markets, are optional, but worthy. Preheat the oven to 350°F. Place each squash half, cut side down, in a baking dish. Add 1⁄4 inch of water and bake until tender, 40 minutes. Let cool. Gently run a fork across the flesh to release the squash strands without piercing the skin. Set aside 2 cups of the squash strands in a bowl and reserve the rest for another use. In a bowl, whisk together the rice flour, sesame seeds, and salt. In a small bowl, whisk together the eggs, tamari, 1 teaspoon of the sesame oil, and the white parts of the green onions. Add the cabbage to the bowl with the squash. Add the egg mixture and toss to coat. Sprinkle the flour mixture on top and toss until thoroughly coated. With your hands, create 3-inch patties out of the squash mixture. Line a baking sheet with paper towels. Heat the canola oil in a large skillet over medium-high heat. Toss a small piece of cabbage into the pan and if it sizzles, the oil is hot. Working in batches, cook the patties, undisturbed, for 4 to 5 minutes. Gently flip and cook until golden brown, 2 to 3 minutes. Transfer to the prepared baking sheet to cool slightly. In a food processor, combine the mayonnaise, miso, remaining 1⁄2 teaspoon sesame oil, and a squeeze of lemon juice. Process until well combined. Pour into a small serving bowl. Place the fritters and miso aioli on a serving platter. Garnish the fritters with sesame seeds, the tops of the green onions, and a handful of bonito flakes and serve. I must admit, I couldn’t stop eating these after I made them. They’re just so delicious, and it’s nice to use something other than potato for fritters. But the miso aioli! That stuff is crazy-good!